Place graham crackers in a food processor and process until small crumbs have formed. Stir in butter and sugar. Press into a 9-inch pie plate. Bake for 15 minutes. Allow to cool slightly. Whisk together egg yolks and lime zest until light green in color. Whisk in condensed milk followed by the lime juice until smooth. Allow to set while pie crust cools slightly. Crust must still be warm. Pour into warm graham cracker shell. Bake in oven for about 20 minutes, allow to cool on a baking rack for one hour. Refrigerate for at least 3 hours before serving. 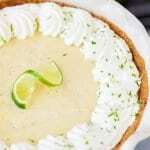 Top with whipped topping and garnish with lime slices.